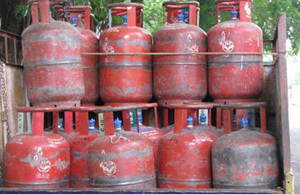 Aizawl, Jun 18 : Acute scarcity of cooking gas has hit Mizoram extremely hard as people are struggling to cook a day's meal. Alternative cooking devices have started selling like hot cakes with the perpetual scarcity of cooking gas. Theft of LPG cylinders have become more common than theft of mobile handsets and laptops and with the value of cooking gas increasing, theft cases have also increased, police said. A number of restaurants had to close down due to cooking gas shortage while some private hospitals, including the Greenwood Hospital, were forced to stop providing food to patients due to the scarcity. However, while the people at large and many establishments suffer, there are some businessmen who are reaping huge profits from the scarcity of cooking gas. Charcoal sellers in Aizawl said their sale has been much higher in the summer than last winter, which was recorded as the coldest winter in Mizoram. Mawii, a charcoal seller from the southern part of Aizawl city said her sales had increased by three folds compared to sales during winter and the cost of one bag of charcoal had increased from Rs 280 to Rs 350. "Even after increasing the price, we cannot meet the charcoal demand as more and more people are forced to use charcoal as alternative fuel for cooking," she said. The sales of stores selling electrical stoves have also increased tremendously. An owner of a store selling electrical stoves said earlier they would sell around 100 'Infrared' stoves in half a year, but now 100 stoves are sold off within two to three weeks, even though one stove costs Rs 2,200 to Rs 4,000. Charcoal-based stoves made in Manipur, Meghalaya and locally are also selling like hot cakes. Employees of a travel agent in Aizawl had to purchase a charcoal-based stove for an official of the Lengpui airport as the official nearly died out of starvation due to the unavailability of cooking gas. An LPG cylinder costs around Rs 1,000 in the black market, but that too is impossible to find now even if you are willing to pay more. Intermittent power cuts in the state is only adding to the woes of the people here as the public health engineering department could not continuously pump water due to the frequent power cuts leading to scarcity of water.